Hi and welcome to my second Spelling Bee Saturday. 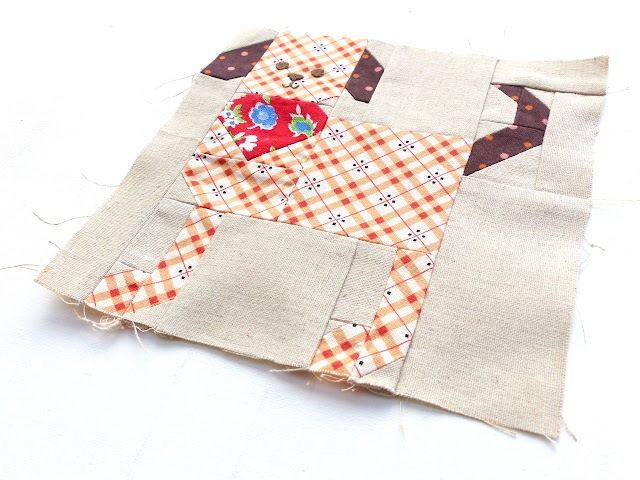 The Fat Quarter Shop and Lori Holt sew-along is now 20 weeks in and I am this Saturday's guest blogger. 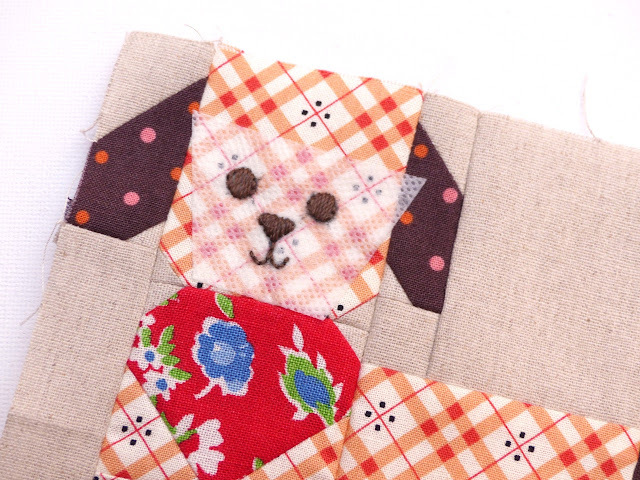 I was lucky enough to make the Dog block which does bear a little resemblance to my own little dog Lottie! All the blocks in Spelling Bee are rotary cut and I chose to make the block at 6" finished - all the picture blocks have instructions for both 6" and 12" blocks. There are lots of little pieces so it helps to tick the cutting list as each is cut as well as use some post-it notes for identification. In the head and the bandana sections below, I took a bit of extra time pinning to get a good alignment where the seams meet. For the embroidered features, I used a snippet of Sulky Solvy. 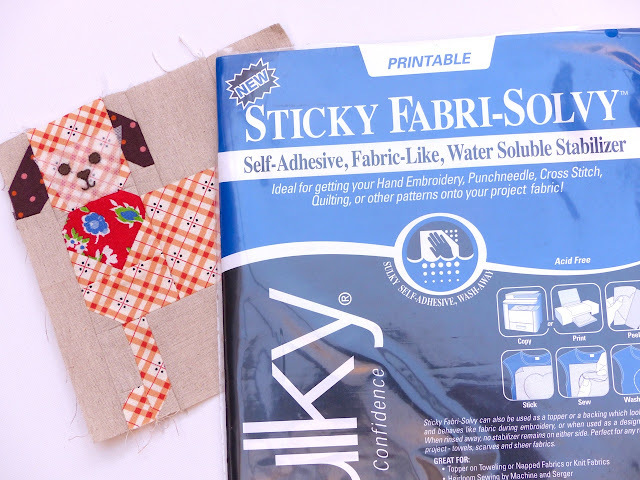 It took me a while to love this product - sewing with it in warm weather can be a sticky experience! The more I've used it the more I've enjoyed it, especially the stabilising effect it creates (especially good for a single layer of quilting cotton) as well as it being easy to trace on with a pencil. The features are embroidered in Aurfil 12wt thread. This one is joining some of the other picture blocks I've made for a small quilt combining some of Lori's blocks with some picture blocks I have from other projects. Such a sweet block - love it! Your embroidery is so pretty. I've heard of the water soluble stabilizer - you did a beautiful job with it. Such an adorable block, and the dog definitely resembles your cute Lottie! Hi Linda, I traced the face- eyes/nose/mouth- from the book onto the stabiliser. 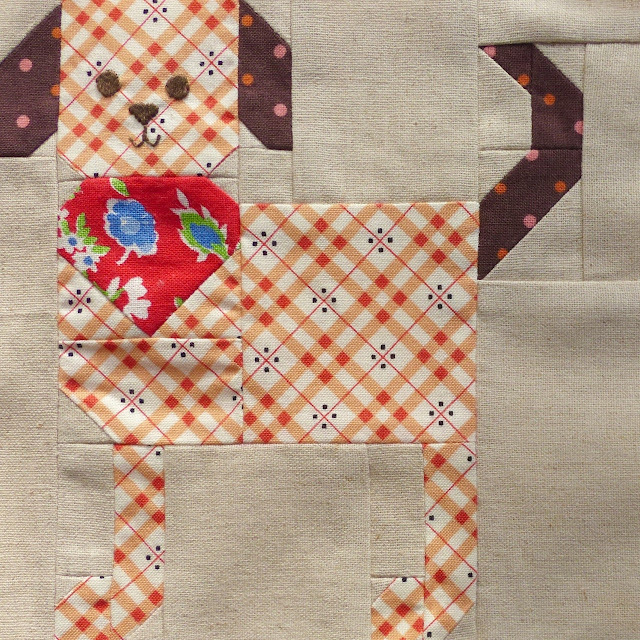 This adheres to the fabric and I used satin stitch for the eyes/nose and back stitch in between for the features. 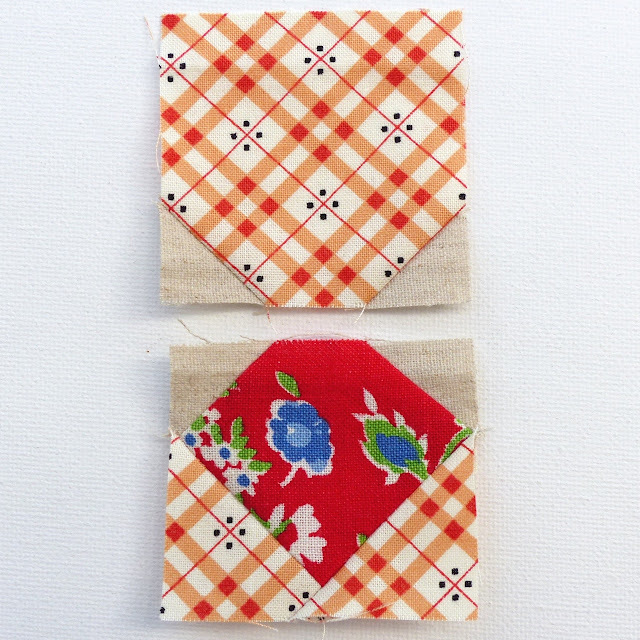 No black fabric, just embroidery! If you click on the 4th pic it'll pop up larger and you can see the stitches. Thanks! Thoseare perfectly round little eyes! super cute little dog! Not seen the super solvy sheets before, will look out for them at the olympia sewing show - love the idea of being able to use them in a printer.